Lithium iodide is white crystalline solid salt but when exposed in air it becomes yellow in color as oxidation of iodine to iodine takes place. 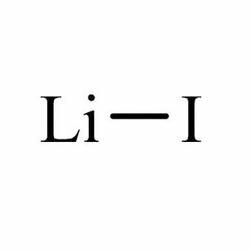 Lithium iodide is extensively used as an electrolyte for high temperature batteries. It is also used for providing longer life to the batteries. Furthermore, lithium iodide is soluble in propanol, ethanol, ethanediol and ammonia. Our company is indulged in providing superior quality lithium phosphate. The lithium phosphate that we provide is used as catalyst for isomerization of propylene oxide to allyl alcohol. It is widely demanded in different building material, glasses and enamel industries as additive. Our product range is checked for quality in compliance with the set industrial norms. 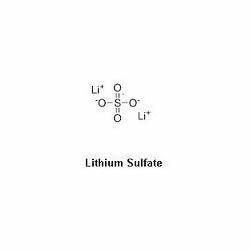 Lithium sulfate is an inorganic salt with molecular formula Li2SO4. Lithium sulfate is used as an additive for manufacturing special glass mixtures and in different building material industry. Lithium sulfate is widely demanded for marking of chemical products. 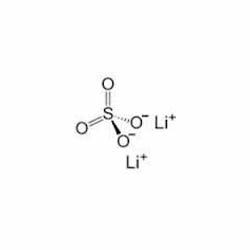 Lithium sulfate is basically the lithium salt of sulfuric acid. It is white crystalline solid which is hygroscopic in nature.